The Play’s The Thing: Monsters, economics, and time travel, oh my! Here’s another installment of The Play’s The Thing, with quick mini-reviews of what I’ve been playing this week. We played a few rounds of this deduction game with six players at game night Tuesday. I quite like One Night Ultimate Werewolf, the predecessor to this, and ONUV has a very similar feel with a few twists. You’re still assigned a secret role, perform your role’s actions when called by the moderator (either from the game’s app or a non-playing person), and try to identify the vampire in a discussion and vote at the end, but there are some substantially different roles, and there are other differences as well. The main one is the ability for certain roles to hand out hidden marks, which can alter other characters’ teams, ability to take actions and more. The marks can be quite interesting in certain cases, adding some complexity and variation to the game, but they don’t always work out perfectly depending on which roles wind up in the middle. Overall, I think I’d take Werewolf over Vampire, and both are mainly an occasional filler for me, but this may be a good new twist on the game for those who play ONUW a lot and are looking to shake it up. 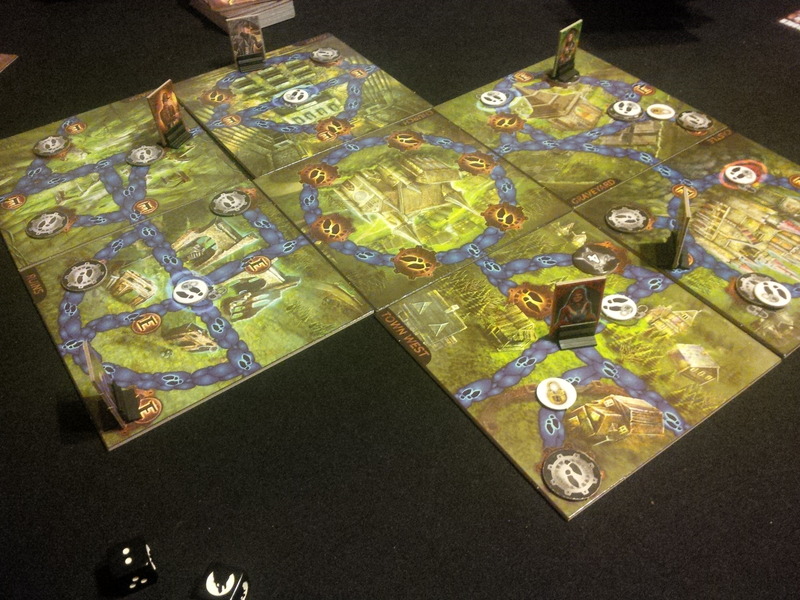 Exploring the board in Transylvania: Curses and Traitors. We also played this Tuesday, and it felt a little underwhelming for me. Part of that may have been playing it with six, which substantially lengthened the time (it wound up taking closer to two hours than 45 minutes), and some of that may have been analysis paralysis on the part of one group member (who wound up winning despite that), so it may work better in smaller groups or with people more willing to take quick turns (it is quite possible with this). Even beyond this, though, this didn’t really work for me; there’s a feel of games like Arkham Horror or A Touch Of Evil, as you’re moving around and dealing with challenges to try and gain sets of cards in order to win, but there seems to be less strategy in this one. You don’t know what the challenges are until you flip them, so you can’t target ones that work with your character’s abilities, and none of the different locations really seem to offer much. There’s also a dramatic variance in the rewards from the cards. Some people never pulled any of the knowledge cards needed to win or anything that substantially boosted their abilities, while others got exactly what they needed. It also doesn’t really feel like there’s a chance for everyone to keep working towards a way to win. The twist of death possibly turning you into a monster and changing the win conditions is interesting, but this wasn’t a game I loved, and it’s not one I’d seek to play again. Managing route networks in Aeroplanes. I got to play my copy of this for the first time in over a year with some friends Thursday, and it was just as much fun as I remembered. Wallace is one of my favourite designers, and this is a very good design of his, translating the feel of building early airline networks very well with danger rolls for difficult routes, passengers needing to go all over the globe, and different planes with different capacities. There’s a money-balancing aspect, an area-majority aspect, three different eras of scoring, plenty of different strategies to target and much more. 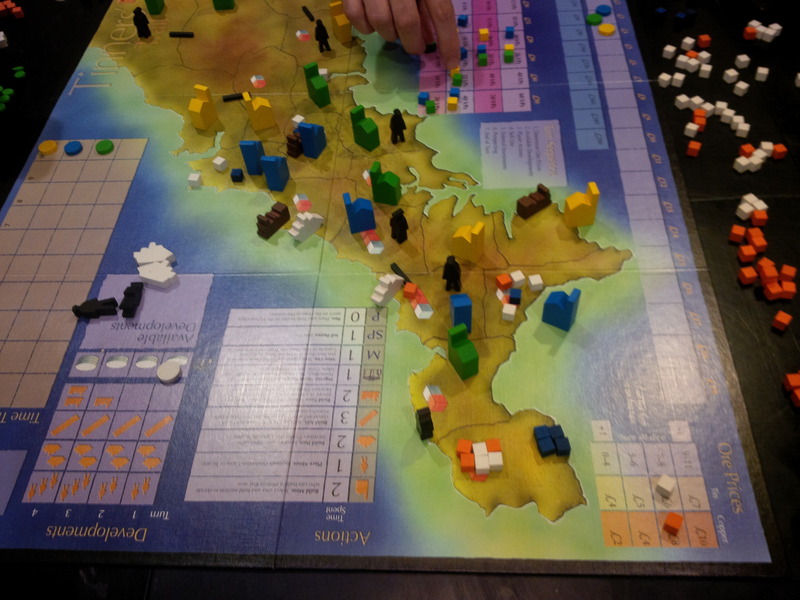 It all adds up to a pretty fun game for those who enjoy reasonably-tight economic Eurogames. I was edged out in the area-majority and profit scoring in the last round, but mounted a comeback thanks to some high-scoring passenger tiles (hurrah for Australia!). Mining for copper and tin in Wales in Tinner’s Trail. This was my first time playing this game, but it’s another very solid Wallace design. It’s about mining copper and tin in Cornwall, with a few neat twists; each area has water that makes mining more expensive, and there are various ways to try and drain the water (pumps, ports, trains and more) and increase your mines’ production, but all of those take substantial amounts of time. There are tensions about which actions to take and when, there’s tension in the price market (which fluctuates every round, and you always have to sell all the metals you’ve mined each round regardless of what the price is), there’s tension in whether to target known parcels of land in the auction or gamble on the ones where the minerals are yet to be revealed, and there’s tension in how much to invest and when (earlier investments bring more victory points, but may take money you need later). I wound up on top thanks to a great third round. I had a blast with this, and would happily play again. 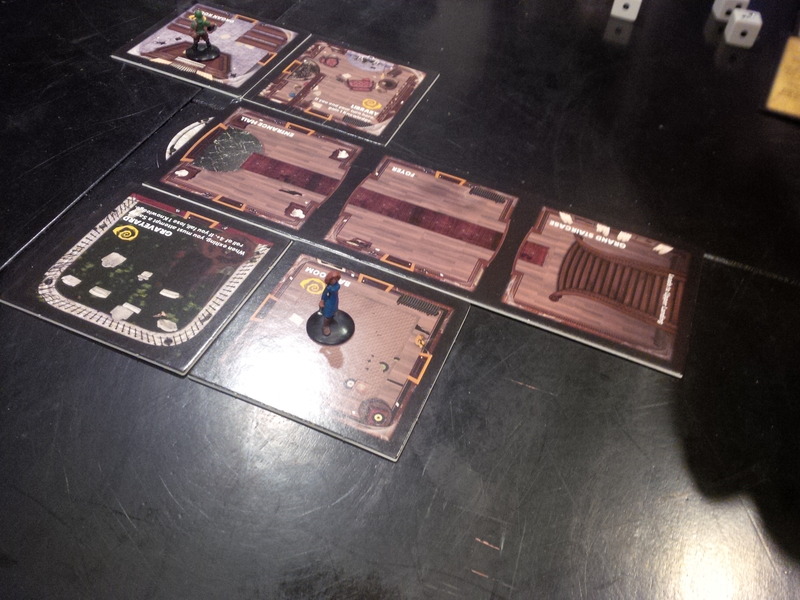 Exploring the mansion in Betrayal at House on the Hill. This was a great way to cap off game night Thursday; it’s another game whose theme works around Halloween, but for my money, this is one far more interesting than Transylvania. It has some of the same problems in that you don’t know what events will come up in certain areas, and there’s a lot of randomness, but it just feels much more fun. It’s scenario-based, and the first half of each game starts with you all just exploring the house before the haunt kicks in, but each haunt has very specific rules and ways to win, and the ones I’ve played through felt like they were well-balanced with good chances for both sides to win. The whole game feels very thematic, and it goes quickly; 60 minutes or less is an appropriate length for it. Moreover, there’s a ton of replay value, as many of the scenarios are quite unique; the one we played Thursday had one explorer having nightmares which were escaping the house, and the rest of us trying to wake him up before too many get out into the world. It led to a lot of tension, and us finally waking him up just before the final nightmare escaped. This was another solid play of this, and one that was a lot of fun. I covered this game a bit last week, but played it again with my wife Sunday and then played a couple of solo games Sunday afternoon. This is still holding up very well for me. 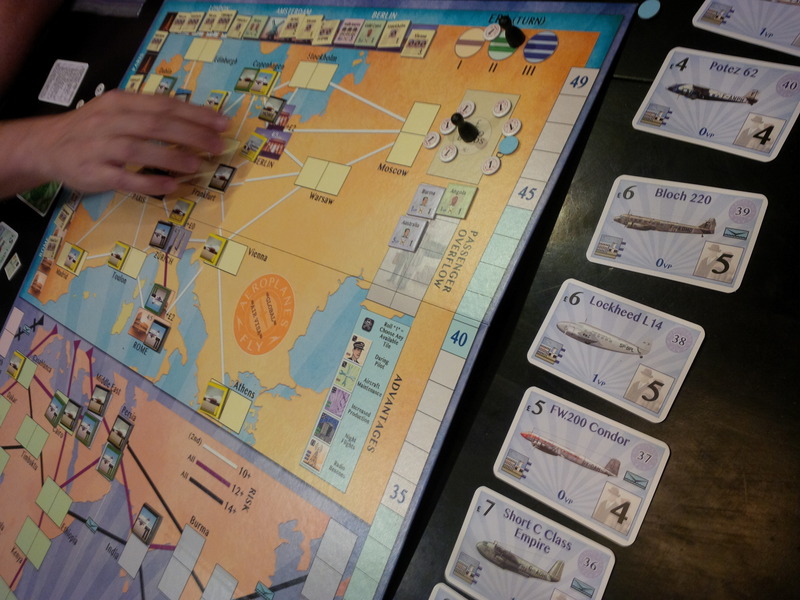 The multiplayer game, which has three ways to win (align the timeline so you can get home, collect the artifacts to complete your mission, or just assemble power by gathering a hand of 10 cards), is a fun and often chaotic jaunt, with you each interfering with each other’s plans frequently. It’s much more strategic than Fluxx and its variants (also from Looney Labs), but it has some of that feel. 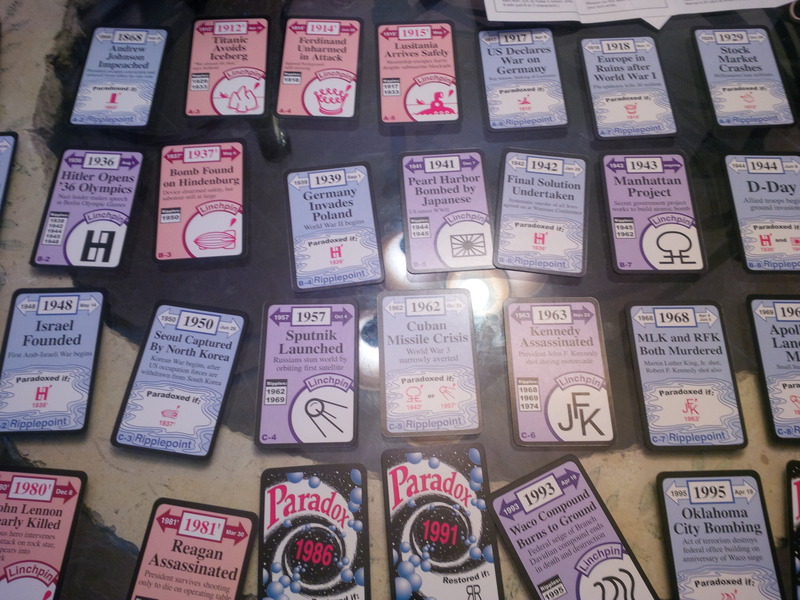 The solo game, on the other hand, is much more controlled, but just as difficult; you have to get eight different time-travellers home in a single pass through the deck, which leads to tough decisions on when to flip which event. This carries the time-travel theme very well, and I’m not only happy to keep playing it, but will probably be looking to pick up some of the expansions down the road. Thanks for reading! Have any thoughts on these games, or anything else you’d like to see on Board and Game? Leave them in the comments, or discuss them with us on Twitter or Facebook.